by the following is prime minister voreqe bainimarama’s statement in parliment yesterday. Madam Speaker, I rise to inform honourable members about aspects of Fiji’s presidency of COP23 – the ongoing UN negotiations on climate change that I will preside over in Bonn, Germany, in November. As I indicated in my New Year’s Address to the Nation, Fiji has been given the tremendoushonour and the tremendous opportunity by the community of nations to lead the world in these negotiations. It is by far the biggest and most important task that we have been given in almost half a century as an independent nation. The world is looking to Fiji to maintain the momentum that was set by the Paris Agreement at the end of 2015 for substantial cuts in the carbon emissions that are causing global warming. And are leading to the rising sea levels and extreme weather events like Tropical Cyclone Winston that devastated our nation almost a year ago. As we all know, the impact is much wider, and includes changing weather patterns that are affecting agriculture, plants, flora, fauna and sea life. I cannot stress enough to every honourable member and to every Fijian the importance of this mission. Not only for ourselves and other Pacific Islanders but for all 7.5 billion people on the planet. In our region, the simple truth is this: If we cannot gain the agreement of the industrial nations to keep reducing their carbon emissions and lower the global temperature, the consequences will be catastrophic. As you already know, three of our Pacific neighbours will disappear beneath the waves altogether. 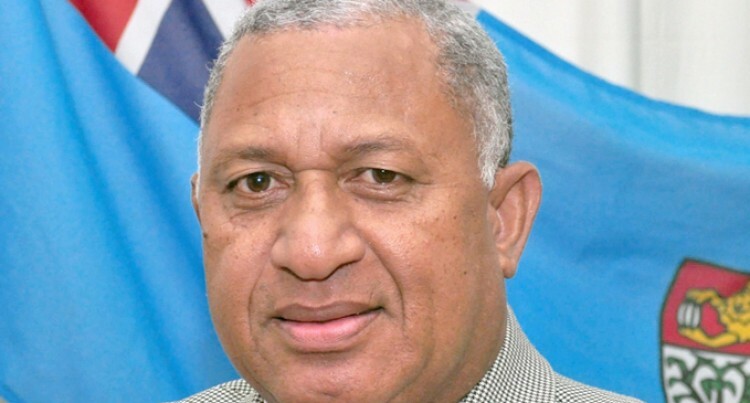 And while we in Fiji will also lose vast tracts of arable land and be forced to move many communities to higher ground, it is the extreme weather events that global warming is generating that pose the greatest threat to our way of life,and our ability to sustain the livelihoods of the Fijian people. Madam Speaker, this is not a false alarm. This is not something that is going to happen sometime down the track. It is a clear and present danger. As anyone who bore the brunt of Winston knows. Anyonewho has had their community relocated knows. Anyone whose farmland has been spoilt by seawater knows. And it is my responsibility as Prime Minister to confront that danger. Not only by doing what we can to future proof ourselves against disaster at home. But to go out into the world and take up the fight for decisive action on climate change.For the global community to act and act now. PM: Failure is not an option. The world has given Fiji the opportunity to lead that fight. At COP22 in Marrakesh last November, almost 200 other nations gave Fiji the task of moving the global agenda on climate change forward. It is a privilege and also a great responsibility. But I want to assure honourable members and every Fijian – as the incoming COP President – that I assume this responsibility with determination and pride. Failure is not an option. I have taken on this job with the intention to do it well. With your support, to show the world what we can do as a nation and as a people. And with the support of billions of people and goodwill across the world, to show that by coming together, we can make a difference and save our planet from the worst effects of climate change. Madam Speaker, I appealed in my New Year’s message for the prayers and support of every Fijian to make our presidency of COP23 a success. And I have been gratified and very touched by the expressions of support I have been receiving. I don’t need to tell ordinary Fijians how critical this mission is. The people of Kumi in Verata, Tailevu – whose sea wall I showed to a visiting UN delegation last week – know it. Any Fijian with the slightest ounce of common sense knows it. So I was shocked and disappointed to see that the honourable Biman Prasad doesn’t seem to know it. The Leader of the National Federation Party issued a statement questioning the priority I am giving to COP23. In his strange view of the world, I am spending my time on something he doesn’t think is important. Well, the leaders of almost 200 countries aren’t questioning it. They think it deserves the highest priority. But, of course, what would they know? Compared to the great mind that leads the NFP on the benches opposite –two members, soon to be three because of the resignation of the NFP President. The honourable Prasad says I shouldn’t be travelling the world talking to my fellow leaders about climate change. I should be leaving it to our ambassadors. Madam Speaker, anyone who knows about international diplomacy, anyone who knows these negotiations, knows that they are conducted leader- to-leader. The statements by the honourable Prasad and other opposition figures demonstrate their lack of knowledge and lack of understanding of the immense challenge before us. This is an extremely serious matter – a life or death struggle to protect our environment and our way of life. Yet the opposition quibbles about me doing what every other Fijian knows needs to be done, not only for ourselves but every vulnerable person on the plant. Flippancy and ignorance in the face of the greatest challenge the world has ever faced. But while he and those like him snipe, we act. While theyplay politics, we tackle our problems head on. And that’s why the world has placed its trust in Fiji, in the FijiFirst Government and in me as incoming COP president to get the job done.Because of our demonstrated level of understanding and commitment to this issue over the past few years. Madam Speaker, last week, we hosted, in Fiji, a high-level delegation from the Secretariat of the United Nations Framework Convention on Climate Change headed by its Executive Secretary, Her Excellency Patricia Espinosa of Mexico. During two days of talks, we received a detailed briefing from the peak UN body on climate change about our duties and responsibilities as we prepare to assume the COP Presidency. I want to place on record our gratitude to the Executive Secretary for coming to Suva and reaffirming the confidence that the world has placed in Fiji to lead the fight on climate change. In our meetings, we agreed that the world cannot afford to drop the ball at this critical stage. More than 120 countries have so far ratified the Paris Agreement, pledging their commitment to address the issues of climate change and to also reduce their carbon emissions so that we can keep the global temperature as close as possible to one-point-five degrees above that of the pre-industrial age. But as you all know, there are worrying signs that the momentum for decisive action may be slowing. It is no secret that the United States federal administration under President Trump appears to be less enthusiastic about the Paris Agreement. Madam Speaker, I intend as incoming COP President to reach out to President Trump to try to reach common ground and move the global agenda forward. As incoming COP President, I also intend to work closely with some of the big players such as China, India, the European Union, Japan, Canada, Indonesia, Saudi Arabia, the UAE, Australia, New Zealand and others to keep the momentum rolling. And, of course, to work closely with our Pacific islandneighbours, international NGOs, civil society and the private sector. My brief as incoming COP President is to represent the interests of the entire world. To be impartial and achieve consensus between all parties on the best way forward. But it is only natural that as Fijians, we have a special interest in the needs of Small Island Developing States in our own region and beyond. Madam Speaker, in the lead-up to the main COP gathering in Bonn in November, we intend to hold a Climate Champions meeting in Suva. And bring Pacific leaders, NGOs, civil societies and representatives of the private sector together to discuss a common agenda for COP. And then in October, a month before Bonn, we will host a pre-COP gathering in Denarau of many of the major players to hone our approach to the main event itself. As the year progresses, we will be making a special effort to engage the Fijian people – and especially our young people and our artists – in the COP process. And that engagement has already begun, with the advertisement on Saturday calling for ideas for the COP logo, that will brand our effort. I urge every Fijian to consider lodging an entry by the closing date of February 24. It doesn’t have to be the final product, just an idea that can go into the mix. Because we will need to refine any concept we receive using graphics professionals to incorporate it into all the platforms on which the logo will appear. Whether it is the COP23 Fiji website, our social media platforms, backdrops or flags. The prize for the winning entry is a trip for two anywhere on the Fiji Airways Network. So my message to everyone is to get those entries in as soon as possible. Because it could be your idea that produces the final logo that will be seen around the world.Global exposure for a global event. Madam Speaker, as I said last week, we are putting together a dedicated Fijian Secretariat to make preparations here in Fiji. And to liaise with the UNFCCC Secretariat in Bonn. We have already allocated office space for this purpose in Suvavou House. Our UN friends have stressed that this is a team effort in which Fiji will work closely with them and the German Government to make COP23 an unqualified success. And we have hired the same expert team of consultants that assisted Morocco with its successful hosting of COP22. Madam Speaker, as to meeting the cost of our commitment, we have already begun the task of raising the necessary funds in the form of donations from an array of nations and foundations. These funds will be deposited into a trust fund here in Fiji that we are establishing with an Act of Parliament. The Bill setting up the fund will be tabled this week. The whole world wants Fiji to succeed in this effort and will provide the necessary resources to make it happen. There will be no need to increase the overall expenditure whatsoever in the Parliament approved 2016/2017 Budget. Madam Speaker, I have the great pleasure as incoming President to announce today that the chief negotiator for COP23 will be Ambassador Nazhat Shameem-Khan, our Permanent Representative to the United Nations in Geneva. Ambassador Shameem-Khanis a standout candidate to lead these very complex and challenging negotiations because of her distinguished legal career and outstanding professional and personal qualities. Madam Speaker, as those people who have been involved in the various COPs know, and especially after the Paris Agreement, the parties face a momentous task to develop the rule book for the practical implementation of the various legal obligations set our under the respective clauses. As you already know, our Climate Champion is the honourable Inia Seruiratu, who, as Minister for Agriculture and Natural Disaster Management, knows the impact of climate change on ordinary Fijians better than most. Minister Seruiratu is one of the Government’s best performers and has already demonstrated his effectiveness as a climate advocate at Marrakesh and in other high level talks in Europe. Our designated Climate Ambassador is Ambassador Deo Saran, our envoy in Brussels. As I have said before, the duties of incoming COP President will require a range of international engagements. Not only for me but for our Climate Champion, the chief negotiator and other members of the team. But as we have said, our domestic agenda will not suffer. We intend to continue the longest running period of economic growth in Fiji’s history into its seventh year. We will continue to strengthen our education and health systems and continue to extend basic services like electricity and water to every citizen. We will continue to improve our road network, footpaths and install streetlightsin urban and rural areas. And if anything, our presidency of COP23 will open up all sorts of opportunities for new investments, both in the private and public sectors in Fiji. Part of our plan is to attract new andcutting edge technology in several important areas so they can be trialed here for eventual use in other countries, including in our island region. We also intendto attract finance for climate adaptation through the private sector. So Madam Speaker, let me reiterate in closing that this is a national effort to lead the global agenda on climate change, which we are also confident will have significant domestic spinoffs. And every Fijian – no matter who they are or where they live – can be very proud of how tall we now stand in the eyes of the world. Madam Speaker, it is critically important that our COP presidency succeed and I sincerely ask honourable members of this House to avoid politicising the issue. They must take time to understand and educate themselves about the Paris Agreement and climate change as a whole. We must all take a united approach to this global issue. Madam Speaker, in so many ways, this is the fight of our lives, for our lives. And certainly it is also about the preservation of our beloved Fiji and all that we hold dear. Our hopes for ourselves and our hopes for generations of Fijians to come. We must all unite as a nation behind this effort, just as the world must unite to do what is necessary to save our planet. Planet Earth, that all 7.5 billion of us,as global citizens, call our home.